When it comes to RFID, the pharmaceutical industry is as different from other markets as a pill is from an M&M. Drug manufacturers are as interested in radio frequency identification as makers of Executive Editor consumer packaged goods. But the needs and goals of the pharmaceutical industry with regard to RFID are different from those of other goods manufacturers. And those differences in goals lead to differences in equipment, overall system set-up, data encryption and utilization, and many other substantive aspects of an RFID system. They also lead to different timetables for RFID implementation. The pharmaceutical and CPG markets have fundamentally different expectations of RFID. For food and other mass goods, RFID has evolved, and continues to evolve, primarily as a way to track goods through the supply chain. But as far as drug manufacturers (and retailers, and others in the industry) are concerned, RFID's raison d'etre is security. "When a pharmacist thinks they're giving out a Pfizer product, we want to do everything we can to make sure it's a Pfizer product," says Byron Bond, director of trade operations for Pfizer Inc. There are several aspects to security. Perhaps the most prominent is stopping counterfeiting, which is a huge and increasing problem throughout the world: The World Health Organization estimates that as many as 8% of pharmaceuticals worldwide are fakes. 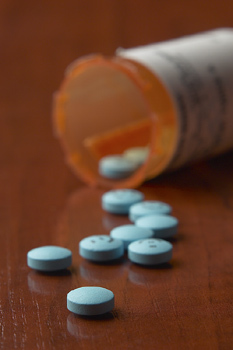 Theft is another problem, especially with popular and/or easily abused medications. A third is traceability, which affects any industry liable to product recalls but is especially vital in pharmaceuticals, where a mislabeled or defective product could have dire consequences. For instance, Pfizer recently underwent a recall of its epilepsy medication Neurontin. The recall was sparked when records at a Pfizer plant indicated that a capsule-filling machine malfunctioned for about 10 minutes. The company ended up having to recall an entire lot of 40,000 bottles of Neurontin--many times the actual number of bottles affected. "Because you can't track individual bottles, we had to recall the entire lot even though we knew there were only a couple of hundred bottles that were likely affected, because of the engineering logs," Bond says. With an RFID system in place, Pfizer could have narrowed the recall down considerably, he says. The Neurontin incident illustrates two of the biggest differences between the drug industry and most others when it comes to RFID. In almost every other industry, RFID started on the case or pallet level; in pharmaceuticals, it's starting on the unit level (bottle, jar, blister and such), the better to serve as a means of authentication. And in the CPG world, the big pushers behind RFID are retailers, especially Wal-Mart, who see RFID systems as a way to drive costs out of the supply chain. In pharmaceuticals, on the other hand, it's the manufacturers who have the biggest interest in establishing RFID, since they're the ones with the most exposure in security issues. "RFID has very strong benefits in both of these industries [CPG and pharmaceuticals], but the adoption of RFID is driven by different reasons in both of these industries," says Yun Kang, director of assessment and implementation services for SupplyScape, a consulting firm specializing in electronic identification for the drug industry. "In the pharmaceutical industry, because it's driven by safety and security, it's the manufacturers who want to really have that security for their products." But what pharmaceutical manufacturers want from RFID is harder to get. Says John Cass, director of operations for drug wholesaler AmerisourceBergen, "It's a much bigger challenge to do what pharmaceutical wants to do compared to what Wal-Mart wanted to do, for example." Probably the biggest challenge, at least from a technical standpoint, has to do with the unit-level identification demanded by the pharmaceutical industry. Simply put, coding and reading is a lot easier at the pallet and case level than at the bottle level; it's easier to read one tag on a case than tags on 48 bottles within. The problem partly is one of simple size; as Bond puts it, "When you're working on a pallet, you can put a much larger [tag] on there." But a more basic problem is establishing a format under which multiple tags can be read at once. Most RFID tags now in use on the case or pallet level operate in the ultra high frequency (UHF) range of 860 to 960 megahertz (MHz). UHF frequencies work best for pallet and case tags because they have a longer read range (from 6 inches to 18 feet), which is required to look at distribution processes, says Rob Coyle, director of global RFID services for GlaxoSmithKline. For units like bottles, the preferred chip technology is the high frequency (HF) 13.56 MHz band. HF tags have shorter read ranges, but have performed better when passing though "HF tunnels," a reader configuration that can pick up signals from individual tags enclosed within a case. They also have the ability to work around metals and liquids. Coyle likens the difference between UHF and HF RFID tags to the difference between AM and FM radio: AM stations have a longer range, but FM can carry high-quality stereo signals at shorter ranges. Whatever equipment is used, the players all along the supply chain have to have compatible versions. That can be especially complicated in the pharmaceutical industry, where medicine often passes through multiple middlemen between the manufacturer and the drugstore. AmerisourceBergen, for example, is one of three pharmaceutical wholesalers that, together, handle close to 90% of U.S. prescription medication. "We have a hard time driving anything. We don't have any products, so we can't run pilots ourselves," Cass says. "And yet we're exposed to handling anything and everything that other people do.... It's challenging enough to get the technology to work in a homogeneous environment like a manufacturing line. Whenever you mix what two or three manufacturers have done in a wholesaler's space, it's much more challenging, as we see it, to get that to work." Players across the supply chain have collaborated on a limited basis with RFID systems. Perhaps the most ambitious such effort was Project Jumpstart, an effort by five major drug manufacturers, two distributors, and others to establish RFID across the supply chain for specific products (each of the manufacturers specified two such products). The first phase of the project ended last fall. All players agreed to set up a separate supply chain for the subject products, using standard, commercially available RFID equipment. Codes and protocols were based on existing standards from EPCglobal, the non-profit organization that is striving to establish uniform electronic product code standards. They included product identification, lot number, expiration date and other information. Collectively, the data amounted to an "electronic pedigree," or a continuous record of the medicine from manufacture to ultimate distribution. The group settled on 915 MHz tags, rather than the lower-frequency tags often recommended for unit level, says Jamie Hintlian, a partner with health and life sciences supply chain practice at Accenture, the consulting firm that coordinated Project Jumpstart. Since the reading was done by case, not by pallet, the UHF-range tags worked on the bottle level. The players in Project Jumpstart are currently engaged in evaluating the experience. One of the reasons they were able to communicate information so easily across the supply chain is that Project Jumpstart involved a centralized database, on a single set of servers, that accepted and doled out information. Such a database would not be practicable across the pharmaceutical industry as a whole--but it wouldn't really be necessary, Hintlian says. "What happens is, the information that's required for the [electronic] pedigree gets successively passed forward," he says. "In that way, the relevant pedigree data carried forward in much the same way that advanced shipment notifications get passed forward between trading partners. That obviously would not require a centralized database." Other RFID pilots are taking place in the pharmaceutical industry, most notably one involving Purdue Pharma's OxyContin, a widely abused painkiller. Under the current pilot, coordinated by SupplyScape, Purdue applies RFID tags to bottles of OxyContin and ships them to wholesaler H.D. Smith. Smith then assembles orders for selected pharmacies, using the RFID information to authenticate the shipments. Pharmaceutical observers agree that RFID is coming to their industry. The biggest challenge will be getting everyone on the same page in terms of standards.